Harald Hel from Austria has broken several world records for kick scooter riding. You can find his web site at www.hey-to-hel.surfino.info. 24 Hours: 372.15 km [231.24 mi] at the 24 Hours Cycling marathon in Grieskirchen (Austria), 30 June 2007. 1 Hour: 26.89 km [16.71 mi], 10 June 2006 in Grieskirchen. 100 km: 4:30 hrs on a street course in Mongolia in September 2001. 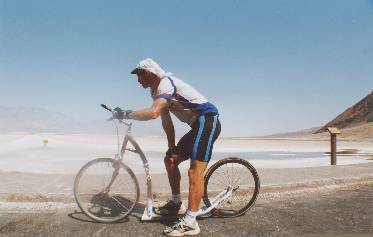 200 km: 10:40 hrs crossing the Sahara in Egypt in 2001. Fastest trans-Australia crossing: 2800 km [1750 mi] in 19 days from 9 - 27 September 2001. A movie (RealPlayer, 900 kB) can be downloaded HERE.